Colored lights, blue skies and beautiful reflections from the outside looking in. Who doesn't love being slung upside down at high speeds, against gravity, scared witless? Nice colored lights against a sunset sky. And of course, a merry-go-round, going round. The previous night, tragedy struck when this ride aptly called the Vortex started up again before passengers disembarked. Several were injured after being thrown off to the ground below. The investigation is ongoing as I write this. Accident Scene. 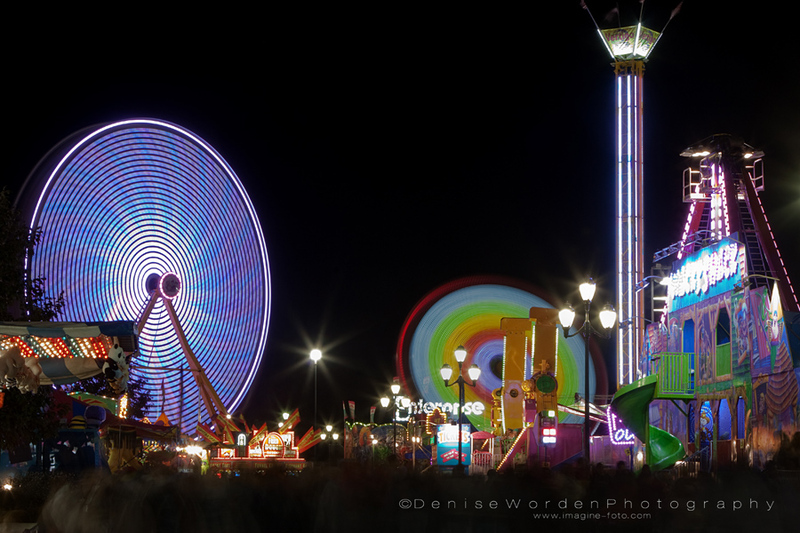 There was a tragic accident on this ride the night before, injuring several fair goers. 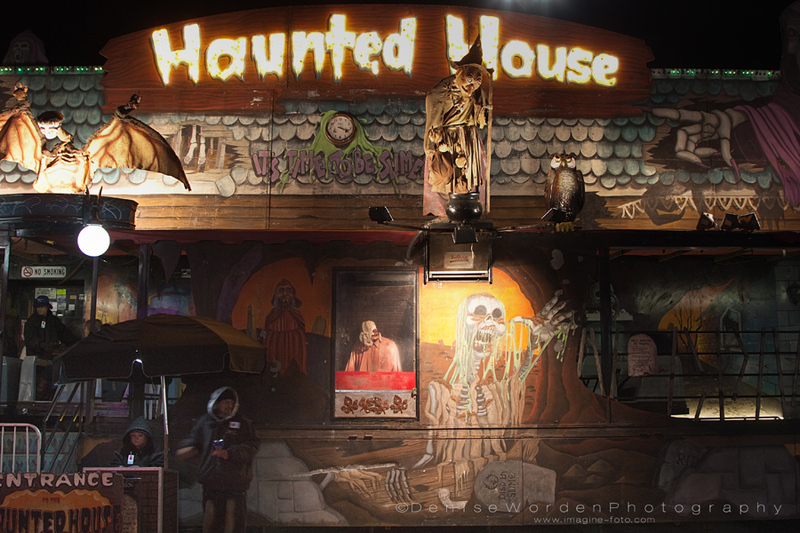 Can't have a fair without a Haunted House. By the time I took this shot, I was lost in a maze on the Midway. I didn't need to go inside the Haunted House! What's a fair without a haunted house? Okay, don't laugh, I walked in endless circles trying to find my way off the Midway. I'd head towards the place I thought I had entered only to be blocked in by barricades repeatedly. I was having visions of a Twilight Zone like horror story repeating the same circle over and over and over, never escaping. Carnies hawking their games, elbow to elbow crowds, dizzying rides and screaming riders, I was trapped in Midway Hell. I used my phone a friend to call my sister. She is more familiar with the lay of land at the fairgrounds and I needed a calm voice of reason to help me get my bearings... "if I remember correctly, I think you need to head towards the Village of Yesteryear" she said. Another U-turn, circle around the entire Midway again and navigate around the Grandstand track was all I had to do. Great. Five long hours after my arrival, exhausted, I eventually made it to the exit. Relieved to be on my way out, I took one last shot and a look back. Finally, the view from the outside again. 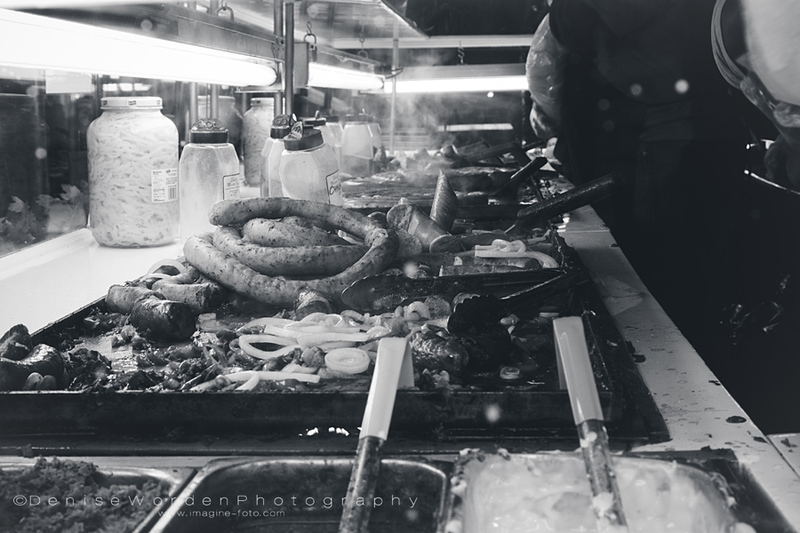 Don't get me wrong, I enjoyed photographing the sights and colors of the fair. I just don't need to ever go again. I wish I'd spent more time shooting the animal exhibits, but frankly, people gawking at the prize livestock trapped in pens depressed instead of inspired me. I missed the horse shows, which I think I would have enjoyed. 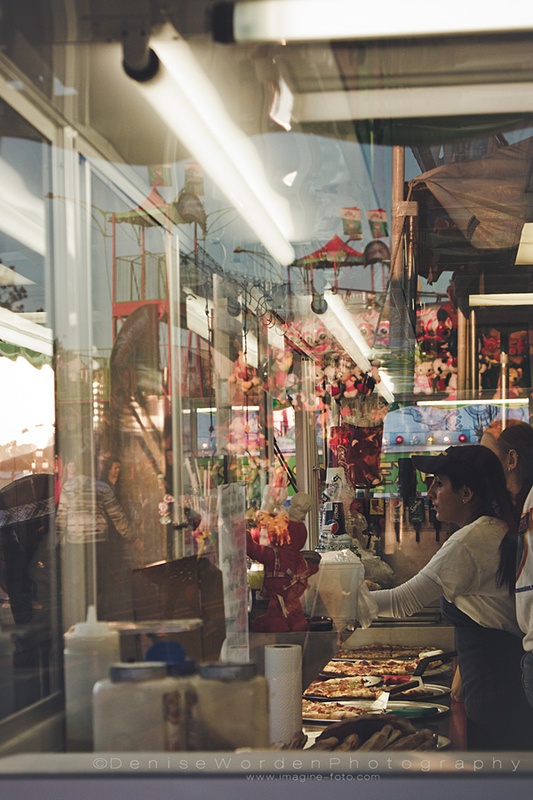 Tell me what you like/don't like about the fair! Pink Floyd - "Brain Damage"
The Rolling Stones -"19th Nervous Breakdown"